KIEVE – Ukrainian troops and pro-Russian separatists on Wednesday fought their first serious battles in months and Ukraine’s defense minister said an attempt by rebels to take the eastern town of Maryinka had been thwarted. The separatists denied their forces had launched an assault on government-held Maryinka, a town which had a pre-conflict population of about 9,900 and lies 15 km (9 miles) west of Donetsk. They accused government troops of firing artillery at rebel territory around Donetsk, killing 15 people. Electricity supplies have been cut off, trapping hundreds of miners underground in two mines, they said. The fighting, in which both sides used heavy weapons, went far beyond the regular low-level skirmishing which has regularly punctuated a ceasefire brokered in February by the leaders of Ukraine, Russia, Germany and France, but which has nonetheless claimed lives on an almost daily basis. The fighting started around 3am (2000 ET) and ended almost 12 hours later. “For the moment, storming operations have been halted,” Defence Minister Stepan Poltorak told reporters. 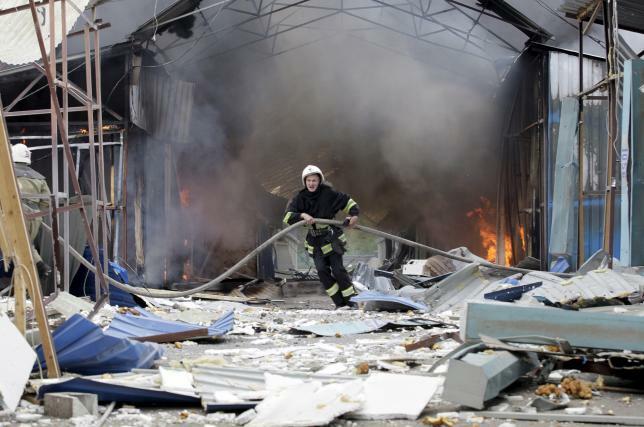 A military spokesman was later quoted by Interfax news agency as saying that separatists had launched new attacks on Maryinka and that parts of the town were on fire. Other spokesmen said government troops were still in control. Many heavy weapons have been pulled back, under the ceasefire agreement brokered in Minsk, Belarus, to put the warring sides out of range of each other’s big guns. But the Ukrainian military acknowledged it had used heavy weapons. “For the purpose of appropriate response, we were forced to use heavy artillery,” military spokesman Oleksiy Mazepa said on television channel 112. He said 15 fighters and civilians had been killed as a result of shelling on rebel territory and more than 900 miners had been trapped underground after the clashes caused a power failure at two larges mines, Skochinsky and Zasyadko, in Donetsk. They were later evacuated, the separatist emergency services said.